*A defense lawyer for Michael Jackson’s doctor said Wednesday the singer was so anguished about his deteriorating finances in his final days that he took desperate actions that caused his own death. 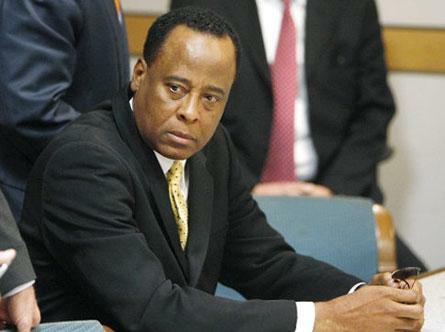 The statements by attorney Edward Chernoff came during a pretrial hearing in the case of Dr. Conrad Murray, who has pleaded not guilty to involuntary manslaughter in Jackson’s death. Chernoff was asking to see Jackson’s financial records to prove a key defense theory, reports the AP. Deputy District Attorney David Walgren accused the defense of trying to distract from the main issue of the trial — whether Murray acted with gross negligence when he gave Jackson the anesthetic propofol and other sedatives on the day he died..
Attorney Howard Weitzman, representing the late singer’s estate, also opposed the request for financial records. “Is the theory that Michael Jackson committed suicide, took his own life?” he said incredulously. “I don’t think that’s a salable theory. The judge refused to grant the request. Lawyers were ordered to return Thursday to continue screening prospective jurors through written questionnaires. Jury selection is scheduled to move into open court on May 4 and opening statements are expected on May 9.
at this point, even it this nitwit was innocent of killing the king of pop, his lawyers are such bumbling idiots that his black azz is going to due time for simple act of hiring these keystone cops.